Conveniently located in the heart of downtown Houston, Hilton Americas-Houston offers easy access to the city's most popular attractions. 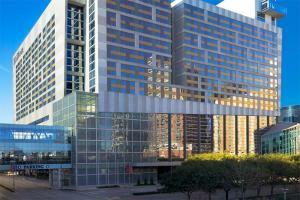 This AAA Four-Diamond hotel is connected to the George R. Brown Convention Center and is just steps from Discovery Green Park, Toyota Center, BBVA Compass Stadium and Minute Maid Park. Spacious guest rooms and suites offer comfort and convenience with a host of modern amenities. A variety of onsite dining options and a full-service spa ensure a relaxing stay. Located in downtown Houston, approximately 25 miles from Houston International Airport and 12 miles from Houston Hobby Airport.